5-Stars Friendly and knowledgeable, and SUPER patient staff. Great prices. I am one of those annoying educated consumers that come in with values and internet print outs and try to haggle the life out of people. They went over every detail with a smile! Ended up getting a great deal! Very happy customer. Great place to buy a car!! WE LOVE TO HEAR FROM CUSTOMERS!! 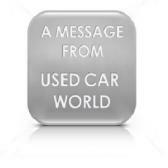 Send your testimonial to usedcarworldpa@yahoo.com and we'll post it to the site! (We'll just use your last initial in the posting) THANK YOU!!! USED CAR WORLD HAS THE BEST CUSTOMERS ON EARTH!! And make sure you check out our "Why Us" page! It's loaded with lots of great information on our loan and car buying programs, blog posts, links and information about car buying! I know the owner here and this guy has been in the business since I was a kid. My mom bought cars off him. If he doesn't have what you want he'll find it! And they WILL get you a car loan. I sent people down here and I couldn't believe they left with a car. And he paid me for sending people that bought a car!! You can say a lot of bad things about used car dealerships but this one has been doing this forever. There's a reason a place can stick around so long. This is my second car from this place. They gave me a bunch of money for my trade and I used that as my down payment. All I had to do was write a check for the taxes. I found the truck on craigslist where they list all their stuff with prices and everything, which is nice since a lot of the other places who's cars were on there didn't have prices and when I called on the phone none of them would even give me a price on the phone. I took in the ad and they got me a loan. They were really nice and I got a really nice truck and can work again and the payments aren't bad at all. Ill be going to see them next time. Appreciate the shot! Extremely happy with my purchase! I have bad credit, and seeing other people's comments, bad credit is apparently what they do here. They asked me to review my experience good or bad since its seems people are only motivated to review when they have a bad experience. Its rare to see a good one, but I can understand how they were able to get them. My last car broke down, and I was stuck. My credit is very bad. I called a bunch of places to see if I could get a car loan and was turned down. I found a used car world on craigslist and put in an online credit application. Dan called me in minutes with my approval. I was shocked! When I came to the lot Danny patiently went through five different lenders until he was able to get me into their buy here pay here program. He sat with me half the day (kids in tow!) to get me a car loan. He explained every detail of my loan to me and even got me a 2 year warranty. In two hours, I went from desperate and scared I was going to lose my job to driving!!! I drove away that day in my new car.. I have a new car that I love and affordable monthly payments. They have knowledgeable friendly and super patient sales people and they were able to do what no one else could!!! I would recommend them to anyone!! I have terrible credit, and needed an auto loan. These guys were great!! I am working and a student. Needless to say I didn't have a lot of cash on hand and especially needed affordable payments. I called at least fifty places and after a ton of run around I was sent home on foot. I finally found used car world and with only a down payment, pay stub and my license, they were able to get me financed on a nice car that was perfect for me. Very grateful. They gave me a second chance. Thanks! YAY! LOVE MY CAR ITS AWESOME!!!! AND I CAN ACTUALLY AFFORD MY PAYMENTS!! THANKS USED CAR WORLD!!! My truck is really nice. Found them on the web. I looked at other places too but they didn't show no prices! I called to ask what the price of cars were and they told me they wouldn't say over the phone either! All I wanted was to know how much I was paying. I put in the credit on the site and got an email with an approval saying I was gonna get a call. I did. It was like minutes. Then they called me to come in and get the truck and bring the my stuff down for the car loan. Through the hole thing I knew what I was paying and what I was getting. Cant say enough. I cant stand most car dealers cause they try to use all kinds of sales crap on you and you end up not even knowing what you did till you get home and realize. They were up front about everything. PLACE IS GREAT!!!!!! IF YOU HAVE BAD CREDIT THEY DON'T CARE! THEY WILL GET YOU A LOAN!!!! Got a awesome truck, and no joke I got the worst credit. Still got me a loan. And they cracked me up the whole time. I laughed so hard! I brought nothing i was supposed to. Dan called my work for me and went online to get my stubs and bank letters. There were other people there but he made sure he did everything on mine first. Even helped me get insurance. Even the insurance was waaayyy cheaper than what I ever had. It was like HALF the price of my old insurance!!!!!! So happy to be on the road again. I have never written a review in my life but this place is great!! They got me financing even though I had bad credit. and I know when they say they will get you a loan they are telling the truth cause they went through like three lenders to find one that would take me cause Im self-employed. All I had to do was print out bank statements. He said that's what makes them different cause they work with a ton of different lending companies cause this one takes this and that one will only take that. I had bad credit and no paystubs. I was almost shocked that he got me approved. and he gave me all of the information about everything I was paying for. and they give you a warranty in case anything goes wrong. and they called me a week later to make sure everything was ok. This is less of a testimonial and more of a thank you. My situation was so horrible. I had bad credit and I had only started my job a month before gong to the lot for the car. I was bumming rides of of anyone and everyone and if I didn't get a car, I was gonna lose my job again after being out of work for over a year. Danny went above and beyond. REALLY!! BELIEVE ME!! After hours of working on getting me a car Danny was able to lend me the money through their buy here pay here. And even after the sale, I realized there was no spare tire (someone must have taken it out at some point). Danny called me to follow up (I was SHOCKED!! AFTER the sale!!!) and I told him it was missing and he had one for me in an hour! All I had to do was pick it up! I was extremely pleased with everything. I am so happy that I didn't have to get a junker cause I didn't have any more money. Instead I was able to use the money I had and make payments on the rest and I have very nice and clean and newer cobalt instead! Thank you thank you thank you!!!!!! Awesome car dealership!! Thank you Used Car World! I had heard that there were places like yours that can do bad credit car loans but I was afraid that I would end up getting railroaded by the terms and end up paying a lot for a not so good car. I am so grateful I found you! I didn't want to be set up to fail with crazy monthly payments, but now I'm DRIVING and have affordable monthly payments. Have a blessed day!! WITHOUT A DOUBT THE BEST CAR LOT IN THE BURGH!! Me and my family been buying cars from here for years. I'm on my second. I was on a buy here pay here loan and I totalled my last one and they helped me fill the claim on the last one to get the new one!! Who does that??? They really try to work with you before and after they sell you the car. I had some money problems while I was paying my last loan and they really helped me out. Anywhere else, I would have been repoed and I'd be shopping somewhere else. They know if they treat people right the customers that they have will come back. Thanks! Go see Dan if you want a car loan and have bad credit! He'll hook you up! So happy with my car! Great car lot. Lots of good guys there. No pressure. I swear it was almost like they were trying to talk me out of the car making sure it was what I wanted. He told me every detail about the car. Printed me a carfax WITHOUT asking. Went right in with the craigslist ad and everything was just like they said including the price. If you want to know if they can get you a loan, I can tell you if they got me a loan they can get anyone a loan. My wife and I got divorced and my credit got run sky high!! I put in applications all over the place. I put in my credit application on their website and got an approval in like ten minutes. They called me right away and set me up with the finance manager and he got me the terms of the loan right there on the phone! (Half the places I called wouldn't even give me a price over the phone much less anything else.) I knew what my down payment was too. I never had sales people be so upfront in my life. Usually there's always stuff they don't want to answer on the phone cause they want to get you there and try to pressure you into buying. I was very happy with my whole purchase here. No headaches. No nonsense. At Used Car World we are proud of the quality used cars we sell and our dedication to serve the needs of our customers. This is reflected in the amount of repeat business we receive. Whether this is your first purchase with us or one of many that you've had, you can count on our dedicated sales staff to make it the best buying experience possible.